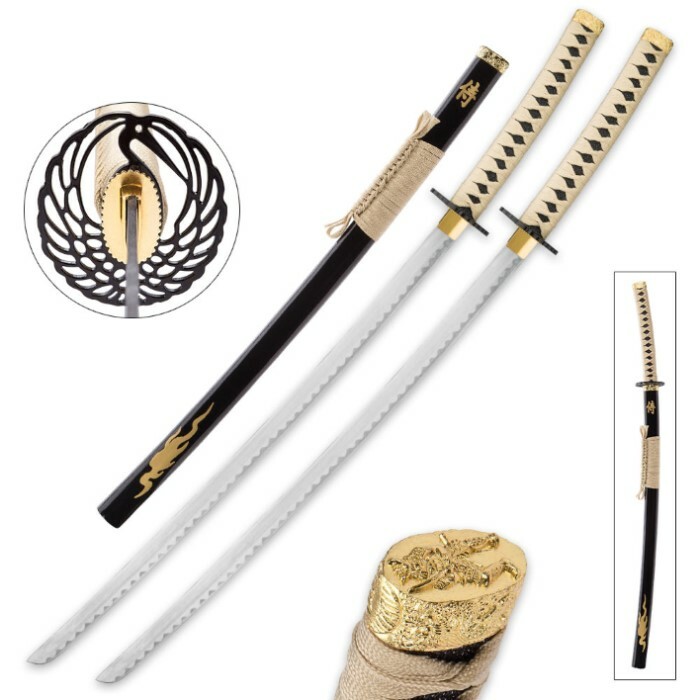 Goldenfire Twin Display Katana Set - Includes Two Display Swords with Scabbards, Wooden Double Stand | BUDK.com - Knives & Swords At The Lowest Prices! 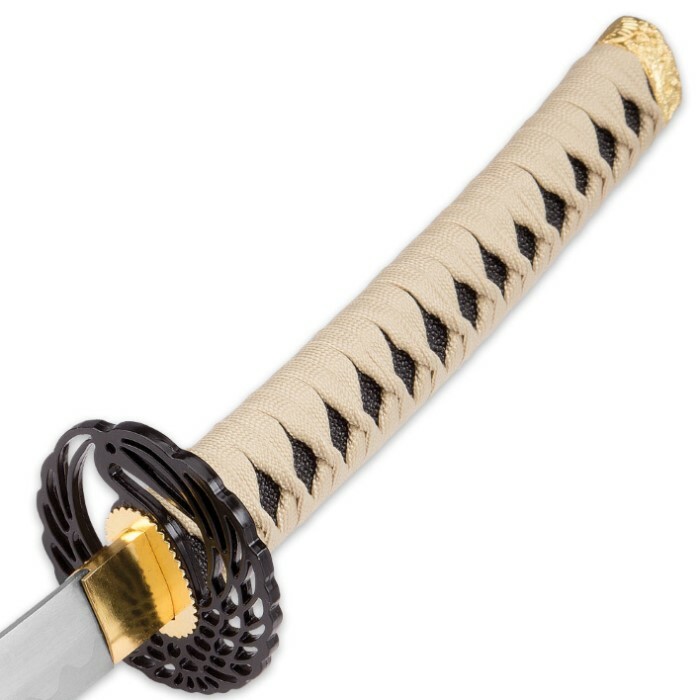 Add a touch of "samurai spirit" to your home or office without breaking the bank! The Goldenfire Katana Set offers authentic Japanese style and eye-catching warrior allure at a price that's well within reach of even the most budget-conscious sword collector. Especially when perched on the included wooden stand, these identical twin display katana demand attention and admiration. 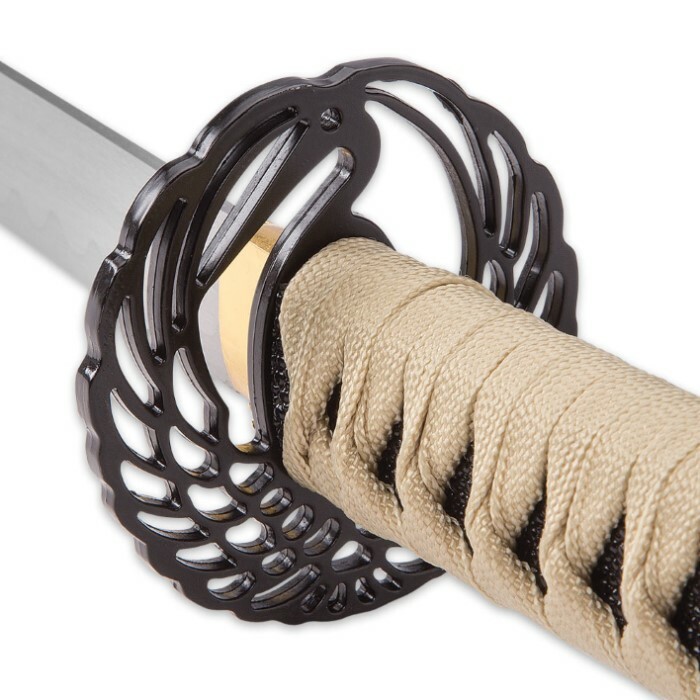 The Goldenfire set is teeming with exquisite appointments and aesthetic appeal, and - true to the legendary katana's ancient roots - each sword is expertly crafted using quality materials and proven, time-honored techniques. Carefully polished to a magnificent glow, the impressive carbon steel display blade glints and gleams with every swing and thrust. A classic hamon line imparts authenticity and grace, waving fluidly across the blade like the natural tempering lines on centuries-old katana. The guard is exquisitely cast with a unique skeletal framework design that's both elegant and bold. Shrouded in black, the guard beautifully offsets the tan cord handle wrapping and brilliant golden pommel. Stunning relief work adorns the pommel; an iconic Eastern-style dragon lithely encircles the sides and a lone samurai - donned in classic battle regalia - crowns the apex. 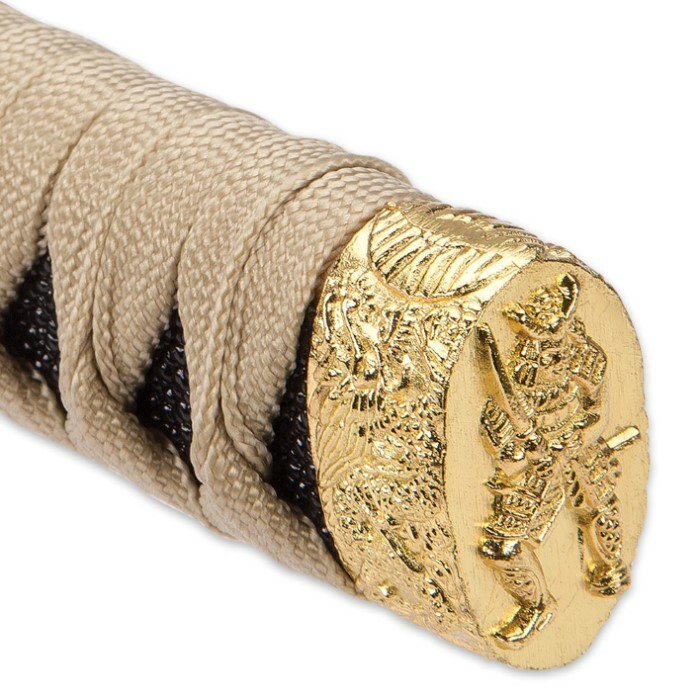 The beauty and majesty continues onto the included scabbard, which boasts tasteful tan cord wrapping and an alluring golden collar embossed with intricate patterns and art. 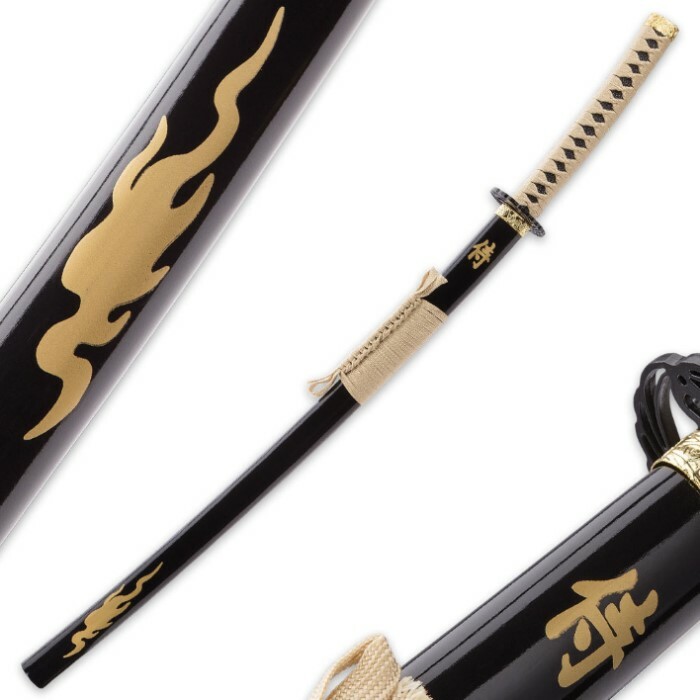 Painted gold accents, including regal kanji and a lone flame motif, pop against the scabbard's glossy black finish. Multiply all this by two and add a handsome wooden display stand, and you've got a sword set worthy of showcasing anywhere - martial arts studio, Asian culture collection, cutlery collection, fireplace mantle, living room bookshelf, bedroom display shelf, man cave, the list goes on. 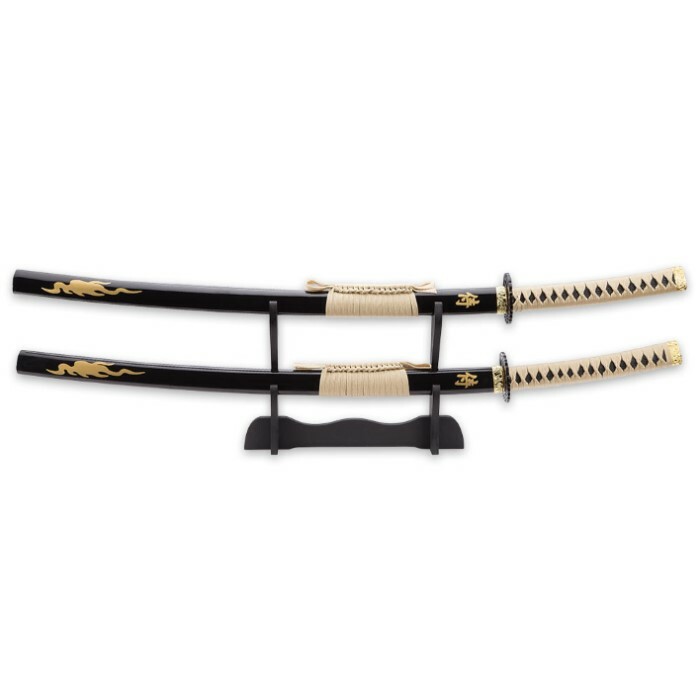 With two swords, two scabbards and one double display stand all in one affordable package, the Goldenfire Twin Display Katana Set represents an outstanding value and is truly a sight to behold; a real treasure -without the "treasure" price tag! Great price and swords look great. Perfect for the home. Shipping was slow, only setback.